This past weekend I had the pleasure of accompanying my mother in her quest to find a new car. We visited a couple of smaller dealerships and each one was singing the same tune: We don’t negotiate. In fact, as soon as we got into the car with the salesman from the second dealership, he made it a point to tell us (as if it was a great service to the customer) they set their car prices competitively and take negotiating out of the equation. “I do,” I blurted out. I couldn’t help myself. I think I understand the issue here. (But, if you are in the car business – please jump in! – I’d love to get your thoughts). Since Kelley Blue Book went online – and now everybody and their grandma has access to the same pricing information – a vehicle’s value is no longer a mystery. All one has to do is plug in the details of an automobile and you soon have its worth. This is a great tool for anyone looking to sell their used car to someone else OR looking to buy one. Dealers have turned this into their advantage by taking negotiations out of the picture completely and just going by the Blue Book OR – (as my mother was told by one dealership) – “the bank sets the price for me and I can’t go any less”. For many people, negotiating anything is a bit of a chore. It’s uncomfortable, can be awkward and – if we’re honest – a little scary. Unlike other cultures, we generally accept what the price is and pay it. Oftentimes, negotiating can make you look “cheap”. No one wants that label. Dealerships have used this fear of negotiating to their advantage too – by eliminating it all together. While I think I understand the issue at hand and many dealers are turning to a policy of non-negotiation, I’m not entirely comfortable with it. Why? Here’s the thing. I don’t know what Ace Dealership paid for that vehicle. Sure, the Kelley Blue Book prices it at $4,500 – but whose to say Ace didn’t pay $2,000 for it? Many dealers buy their inventory at auctions – often times getting great deals on cars that us average car buyers don’t have access to (or the time / know-how to access). So, while the car may be worth a said amount – there is often “room to negotiate”. Now, I’m okay with capitalism and the dealer getting their fair share. But, we’re not negotiating the price of a lamp stand here. A vehicle purchase is one of those big-ticket items we want to make sure we are getting the best possible price on. I’d love to hear if you share this frustration with car buying OR perhaps you are happy with the new way of purchasing a vehicle. If all cars were priced the same way, there would be no need for any of this discussion. The problem is in the inconsistency. Charge x number of dollars for car y in any part of the country. The only difference should be the state tax and title fees. THE END. I laugh when I read stories that most salesman post. My favorite is when the consumers get together and have a common story, usually a bad experience, and a salesman will chime in to say that he or his dealership is different, or they try to tell the group of consumers that they are somehow wrong and if you don’t like it someone else will buy it. When a dealer tells me that they won’t haggle or negotiate or whatever they call it nowadays, I simply leave. It’s a passive aggressive way to say “take it or leave it”, “some other sucker will buy it” etc. Another reason everyone is seeing prices that they don’t like or can’t negotiate is because those “suckers” are paying those prices and everyone employed by that dealership counts on you. My last experience at the dealership involved me calling ahead to ask if they negotiate and the response was, salesman: “yes of course, and we need to sell a few more cars to meet a quota and there are only a couple days left in the month” me: “ok great, my budget allows me $XXK, do you think that we can come to a deal?” Salesman: “definitely, we may even come down further than that”… and when I got there I test drove the car and loved it… And then I met the finance manager who spoke to me for 15 minutes about unrelated topics only to tell me in the last 30 seconds of our conversation that the price is non-negotiable and gave a frail explanation of why, followed by the famous line “if we can work a deal today that would make me happy but if this price does not work for you then I’m sorry”. mind you the there were many contradictions between the discussions with salesman on the phone, the salesman in the dealership, and the finance manger. So for those salesman who make posts saying they are automatically the bad guys when a customer walks in, you can thank your fellow salesmen/finance managers who made it this way. I don’t feel sorry for any of you as you don’t for me. When you make a customer happy with a sale, you build a relationship and more than likely future sales and referrals will come from that relationship. As for me, I will stick to private sales because I have had better luck with them and have made a friend here and there in my time. my car buying experience is horrible, I think all dealers start out good when your looking to buy a new car with a trade attached, then you do the deal you think you got a great deal your deal was a lease or a loan now your in the car say its a lease you lease it for 3 years now you go back to the dealer thinking they can give you another great deal( But NO) you would think your a return leasee and that would mean something but it doesn’t you have no trade to do just the return of a car or truck you leased say its a loan? you have your car or truck and you want to trade that in you are underwater with your loan the vehicle isn’t worth more than you owe and NO dealer wants to help you, Dealers are a necessary evil if you want something reliable and new you have to go to them and they have you by the Ba**s.
As a dealer I can tell you that online sites such as KBB, Edmunds, NADA, etc… are the most inaccurate forms of information for consumers. Keep in mind none of these sites DO NOT buy or sell cars so they don’t have to stand behind their numbers. The information they gather is purely based on averages. A typical dealer uses anywhere from 4 to 6 sources to determine a trade value. These sources change DATA 4 to 5 times per month based on market availability and incentive fluctuation by the manufacturers. Most consumers rate their trade-in as excellent condition when gathering information. The fact is that a typical dealer spends an average of $2000 for a non-certified and $3500 for a certified used car in reconditioning cost. No consumer wants to believe that their beautiful, well maintained trade-in would need that much reconditioning. Manufacturers change incentives on new cars every 15 to 30 days. These changes are based on market availability and demand. The new car pricing, directly affects the used car values. For Instance, When Dodge offers $13000 discounts and savings on a new RAM pickup, that effects the value of all the used RAM pickups out on the road. The websites such as KBB, Edmunds, NADA, etc… cannot keep up with such a rapid price adjustments. Dealers spend 60 to 100k per month to have access to these sites and advertise online. As competitive as the market is, it makes no sense for a dealer to put a price online that can be negotiated. 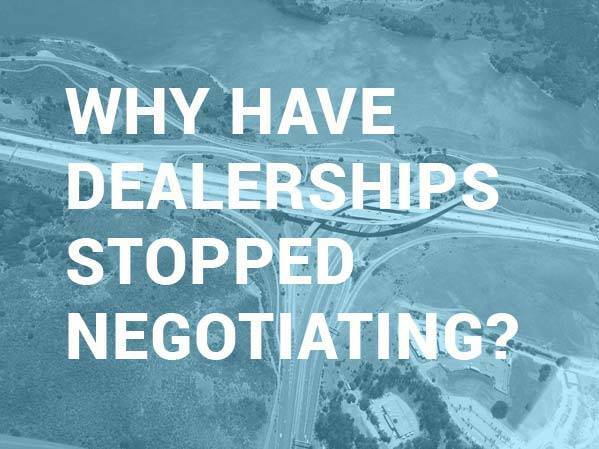 The number one things consumers hate about car shopping is negotiation, and yet their number one complaint is dealers take negotiation out of the equation. Thanks for sharing your first-hand experience Kevin! As someone in the industry, I can say that there is ALWAYS someone who will buy our car at our price. It’s not like that poor Corolla is going to rot away on the lot because you walked away, it just means we sell it tomorrow instead of today. There are pricing tools available to dealers that show us the retail cost of every single similar model on the market in whatever mileage radius we choose. So we’ve already picked that price because it’s A) competitive, and B) retains the best profit for us. There will always be someone that price works for. When the supply and demand equation reverses, then we’ll cater to the client. Agreed. In Ontario everything has to be upfront and included in the price except for tax and licensing. Definitely helps to make things more transparent. I work at a negotiation free dealer, and I have to say, the feedback we have gotten since going to our process is unbelievable. Not only does everyone pay the same for a vehicle, but I am a non-commissioned salesperson. I receive a salary with bonuses based on volume and guest satisfaction. We also have a money back guarantee, which means that if they change their mind in a certain time period and mileage period, they can bring the car back and we cut the entire deal, at no cost to the customer. I am in the car business and I know exactly why this happens. People do have access to all of the information now. So when they do all of their homework and they find out what KBB or TrueCar calls a good price, they come into the dealership and use that as their starting point. It does not matter what I say as a salesperson. No buyer will EVER believe me. Even if the dealership is actually losing 1, 2, or even THREE thousand dollars… Buyers don’t believe you. There are so many restrictions now for car dealers and it is necessary. I can see how dangerous it would be if we had to power to rip everybody off. But the truth is that we have to disclose everything by law and most of us do. I have been fortunate enough to work with good honest dealerships and I genuinely like to help people but it’s difficult when they automatically think of me as the bad guy. In reality, I don’t get a paycheck unless the client is happy and purchases a car. So, yes, some dealerships resort to no-haggle prices so that there is no mystery. And for people that accept that, it can make it go a lot more smoothly. A tip that I would give to car buyers is to shop for the right salesperson. If he/she makes you comfortable and you can reasonably trust them, then you can work together to get a fair deal. They want to earn your business and your repeat business. If they are rude or pushy then don’t work with them. Great tips Nathan! Thanks for stopping by. I am seeing all these car industry people comment but based on my experience I just dont believe these no-haggle prices. They are over priced and can see it by just looking online for a comp from the dealer down the street that has the same thing. I was just at one today and they lost a sale because they werent going to negotiate a price. I went elsewhere to do my business. It’s too bad that all there is is bitterness towards all this, not all places operate like this and if you go to a place of business prepared you will not be taken advantage of, and just because they are selling something doesn’t mean it’s bad. When you actually listen you hear more than if you try to shout your point out louder than someone else. I personally sell cars and when people walk in and tell me what they want I let them know everything I can up front, and if they don’t like it I shake their hand and let them know good luck elsewhere. Because I do want them to get the deal they are searching for weather it is from me or not… Luckily I’m not paid on commission so it doesn’t make a difference to me weather they buy from me or not, but that attitude has actually sold me the most cars over the course of the year at my location. Those who choose to make it a miserable experience only have themselves to blame, control what you can, let go of that in which you can’t ..
“We don’t negotiate” was their opening line of the negotiation. You just decided to accept it. Unless they have a line of people waiting to buy that car it is negotiable. Oh, I pushed em on this Joseph – but they weren’t having it. Very interesting way to do business! It’s actually policy at several dealerships here in my city. These are all good points. I just contacted a dealership yesterday about a car, used of course. They were only willing to take 300 dollars off the price and I thought that was ridiculous. When I searched outside of my state I found the same vehicle actually better with less miles and the price was like almost $2000 less so now I’m trying to decide if I want to go ahead and make the drive. I was thinking about calling the dealership and seeing if they had a closer location instead of driving 2 hours, instead i could just drive 1 hr. But yeah it was it was really interesting. Waiting it out is good also, that’s if you can. Wild! I have found that too – if you are willing to look elsewhere (often in smaller towns) and are up for the drive, you can catch a better deal. Best to you! I got a quote for a new car , a week later I ask my son to go get a quote for the same car, when he returned his quote was $3500 less than mine. So I went a few days later and asked to talk to the manager and ask why my sons quote was different than the one I received. When it came down to it he told me it was because I was a woman. He offered to sell me the car for the lower price, I said no thank you and I would tell everyone I could not to deal with his dealership. He called me a few days later and offered to take $7000 off the new car. I told him I wouldn’t deal with his dealership for the way he treats men and women different. Ugh. I applaud you for standing up against the salesperson on principle Rebecca – even though you could have gotten a good deal. For a used car, if they say “we don’t negotiate,” I’d run away as far as possible. For a new car purchase, I wouldn’t even bother with salespeople anymore. I’ve used Truecar.com to purchase my last two vehicles and using creative geography, paid thousands less than I would have attempting to negotiate with idiot car salesmen. Being that I’m in NJ and have numerous states within driving/bus/train/plane distance, I simply shopped around the general area of 300 miles away and found the cheapest dealership. Confirmed the price with the dealership and then picked up the car and drove home. In 2010, I picked up a new Hyundai Sonata in Maryland for $3,000 less than the cost in NJ. Just makes sense to shop around … even out of state. Hi Andy – yeah, these were all used car dealers. Haven’t tried Truecar.com. Great idea about shopping around in different locations! I will be buying a new car next week. I hope that armed with the MSRP, walking in with credit union financing, and blue book knowledge I can negotiate a slightly above invoice price with the specs that I am looking for BEFORE my trade in and have this paid off ASAP. Any parting advice? Wish me luck! Try “shopping” online-a lot of dealerships will give you a price online, then I go into the dealership and see the car with the sales person. The last three times we have purchased a car-the price I was given online was thousands less than the “best” price when I talked to the sales person at the same dealership. Not negotiating (which I don’t like) but still useful. Hope useful! Really? Same dealership had the price higher on the lot than online? Interesting. I dread stepping into a dealership. My time is too valuable to me to spend hours at a dealership between the test drive, waiting for the “finance” person to speak with me and then going through line by line of the invoice for all of the hidden fees. In most major cities, you can find a private dealer. Private dealers sometimes have used car dealerships, sometimes they just look for a specific car for their client and some do both. They usually just charge their finders fee and the sales tax and then you walk out the door with your keys to your new car. I have bought my last two cars from the same private dealer and have no regrets. One car (a 2009 Volvo V50) I got under Kelly Blue Book Value and the other one ( a 2011 Mercedes C300) was right at KBB value. The cars will alway be used but that’s what I prefer since new cars have depreciated as soon as you drive them off the lot. I would highly recommend finding a reputable private dealer in your area (that’s the challenging part). Thanks for mentioning the private dealer Lynn. I’ve heard of others having good success with them too – and they are generally out for your best interests/needs. I have never bought a car from a dealer. But I love negotiating! I drive a hard bargain. But I grew up in the Vietnamese culture, where everything is negotiable. Grocery at the market etc. so for me, it’s just part of life. Even if the price of the car is not negotiable, perhaps other aspect of the sale may be; oil changes, car washes, etc. Appreciate your perspective Allison. Excellent point about looking outside the box in negotiating (oil changes, washes, etc). I love it. I hate trying to negotiate with a professional negotiator. I can walk away if I don’t like their price. Market value will drive the prices. What are you talking about? I always make money off of a car sale. Even if they sell it at a loss fat cell goes into a sales volume quota which gets the massive bonuses at certain milestones. Any bean counter can look at the claimed invoice prices that dealers supposedly pay and compare it to MSRP. Even if every dealer sold every car at MSRP, which rarely ever happens, they would barely be able to keep the lights on and the doors open let alone providing their employees with enough money to buy their own cars. For an example look at the Mazda CX-5. It’s supposed dealer invoice price is literally 2% under MSRP and I can still get a few hundred off MSRP by just using TrueCar. The real cost to the dealers is Now hidden in a myriad of bonus and incentive programs that are totally hidden from the consumer mostly based on volume. So please refrain from singing the sympathy song for car dealerships. Just ask Paul Miller or Jack Daniels… Both individuals who own several car dealerships in my area and are multimillionaires.